ONASSIS, Jacqueline Lee Bouvier Kennedy. July 28, 1929–May 19, 1994. First Lady, reporter, editor. Jacqueline Lee Bouvier was born in Southhampton, Long Island, the first child of Janet Lee and John “Black Jack” Vernou Bouvier III. Her younger sister, Caroline Lee, was born March 3, 1933, and the sisters shared an intense intimacy and rivalry throughout their lives. Her parents both came from elite, wealthy New York families, whose earlier generations had not been above embellishing their lineages to ease their acceptance into society. This illusion of noble ancestry, fabricated by both families, enhanced Jacqueline’s sense of the dramatic and her instinctive understanding of the power of an image, which she used to advantage in crafting her own image as First Lady. Jacqueline inherited her beauty from her father, an extraordinarily handsome man. A magnet for scores of women throughout his life, his sexual attractiveness was matched only by his self-indulgence. His myriad affairs led to a failed marriage with Janet; they divorced in 1940. Her parents’ angry quarrels developed Jacqueline’s ability to tune out unpleasant things—a skill she would employ in her own marriages—and her penchant to escape into literature, art, fantasy, and horses. Her parents’ divorce left her with deep insecurities and a gnawing emptiness that haunted her, fueling her needs to purchase extravagantly and to marry men of wealth. On June 21, 1942, her mother married the wealthy, twice-divorced stockbroker Hugh D. Auchincloss II, heir to a Standard Oil fortune. Jacqueline and Lee resided with them at Auchincloss’s two comfortable estates, Merrywood in McLean, Virginia, and Hammersmith Farm in Newport, Rhode Island. Janet’s second marriage gained her and her daughters unlimited access to polite society and produced two half siblings, Janet (1945) and James (1947). Jacqueline’s combined families provided a powerful social network that she utilized successfully throughout her life. Jacqueline Bouvier was educated at Miss Chapin’s in New York and Holton-Arms in Washington, D.C., where she displayed extraordinary intelligence and an artistic and literary prowess. At fifteen, she enrolled in Miss Porter’s School in Farmington, Connecticut. She entered Vassar in 1947 and spent her junior year abroad at the Sorbonne in Paris, cultivating her love of French culture and language and traveling extensively in Europe. She completed her education at George Washington University, graduating in 1951. Her interest in publishing began that year when she won Vogue’s Prix de Paris contest; the prize was a year’s apprenticeship as junior editor at the magazine’s offices in Paris and New York. Instead she decided to seek a job as “Inquiring Photographer” at the Washington Times Herald, a position she secured with the help of her stepfather. In 1951, she met John Fitzgerald Kennedy, then a Massachusetts congressman about to run for the Senate, and they began a courtship in 1952. Their wedding took place in Newport, Rhode Island, on September 12, 1953. Jacqueline deeply loved her husband; his first love was politics. His constant womanizing brought tension and pain to the relationship, but conditioned by her own father’s example, she appears to have accepted this behavior as a part of the marriage. She ignored all but his most blatant infidelities, which continued until his death. After suffering a miscarriage in 1955, she delivered a stillborn baby girl in 1956. Daughter Caroline Bouvier Kennedy was born November 27, 1957, and son John Fitzgerald Kennedy Jr. on November 25, 1960. Despite her discomfort with politics, she had campaigned with her husband during his presidential bid in 1960 until pregnancy curtailed her activities. A third child, Patrick Bouvier Kennedy, was born August 7, 1963; his death of hyaline membrane disease on August 9, caused intense grief for both parents. After her husband’s inauguration as the nation’s thirty-fifth president, Jacqueline Kennedy’s exceptional knowledge of art, history, and literature gave her the self-assurance to undertake the restoration of the executive mansion. Her families’ social and political connections provided her with the personal access to accomplish her goal. Bringing together a prestigious Fine Arts Committee of art historians, antiques experts, and directors of leading American galleries and museums, she directed a restoration of the White House that filled the house with historic furniture, portraits, and fine period antiques. On February 14, 1962, she presented the restored White House to a nationwide audience of fifty million viewers in a historic, hour long tour with Charles Collingwood on CBS television. She established the White House Historical Association to continue the mansion’s preservation and successfully promoted legislation that established the White House as a national historic site under the National Park Service. Both John and Jacqueline Kennedy possessed an elegance of mind and manner, but she especially understood the connection between pomp and power, ceremony and compelling historical drama. Her exquisite taste recast the image of the White House as a brilliant stage on which her husband conducted politics and diplomacy, and where leading artists highlighted American cultural achievements. At these events the First Lady deftly lobbied the artists to press her husband for the creation of a cabinet position for arts and culture. Shattered by the assassination, the thirty-four year-old widow struggled with depression, with making a life for herself, and with bringing up her children as a single parent. Although she distanced herself from the Kennedy clan to raise her children with privacy and discipline, she instilled in them a fierce pride in their heritage. In September 1964, she relocated to New York City, where she directed her children’s schooling and worked on plans for the Kennedy Library. During this time, she was linked romantically with several prominent men. The assassination of Robert F. Kennedy in 1968 intensified her fear for the safety of her children in the United States. She soon agreed to marry Aristotle “Ari” Onassis, a Greek shipping tycoon, whose wealth provided her and her children with a secure life. However, her remarriage on the Greek island of Skorpios in October 1968 shattered her iconic status with the American public, and the couple’s initial delight in each other soured. She increasingly spent time with her children in New York City, and he resumed his affair with his longtime mistress, opera singer Maria Callas. Evidence suggests that Onassis planned to divorce his wife, but he died from myasthenia gravis in 1975 without having signed divorce papers. She inherited $20 to $26 million from the Onassis estate. After his death, Jacqueline Kennedy Onassis returned to New York to carve out a life on her own. She resumed her publishing career, first as an editor at Viking Press and then, starting in 1978, as a senior editor at Doubleday. She edited a number of prestigious books and brought noted authors and their works to the press. Now past fifty, she found happiness in a personal relationship with diamond merchant Maurice Tempelsman, whom she had known from Democratic campaigns since the late 1950s. Later he became her financial adviser. In 1982, he moved into her New York apartment, where they lived together until her death from non-Hodgkins lymphoma on May 19, 1994, at the age of sixty-four. She is buried beside President Kennedy at Arlington National Cemetery in Virginia. 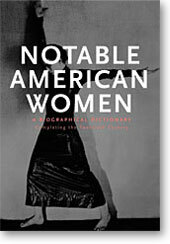 That's just one of the 500 entries included in Notable American Women: A Biographical Dictionary: Completing the Twentieth Century, the volume that brings Harvard's Notable American Women project up-to-date through the end of the 20th century. It's an indispensible reference work that no one interested in American history should be without. Read a significant excerpt from the book, including the Preface, Introduction, several entries and an index containing the names of all subjects. * Copyright 2004 by the President and Fellows of Harvard College. All rights reserved.